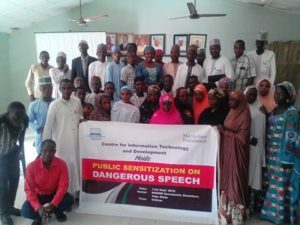 On Tuesday 11th October, 2016, the Centre for Information Technology and Development (CITAD) organized a one day Public Sensitization Lecture on Hate and Dangerous Speech in NANNM Secretariat Damaturu, Yobe State,Nigeria. The event started with registration of participants at 9:00am and participants self-introduction which was the next item on the agenda. . Thereafter, Isah Garba being the Project Coordinator and Senior Programmes Officer gave a welcome remarks on behalf of MacArthur Foundation and Center for Information Technology andDevelopment (CITAD) who are the conveners of the event. Welcoming all participants to the event, he briefed them on what CITAD does as an organization in general and specifically in this project which include monitoring of hate and dangerous speech online and a lot of peace promotion activities and campaigns. He further appealed to the participants to make the occasion participatory by making their contributions and not only listening to the speakers. The first paper presented was on Understanding Hate/Dangerous Speech which was facilitated by Isah Garba who started with a question to the participants: Can someone tell us what hate speech is? Yusuf Tijjani Ali gave syntax meaning of both words HATE & SPEECH and also gave example of Fulani word ‘KADO’ which refers to non-fulani tribe as well Kanuri ‘Kirdi’ to him it was insult word to downgrade the value of other tribes. Speech that denigrates people on the basis of their membership in a group, such as an ethnic or religious group. Speech can harm directly or indirectly, or both. We shall see that it is this capacity to catalyze people into action that is critical to the specific speech act we refer to as dangerous. He called the attention of all participants to note or consider our historical tradition of jokes that have been in use as a means of resolving conflicts in our societies such as that which exist between Fulani and Kanuri , Kanawa and Zazzagawa, or among occupations like butchers and cattle rearers etc. 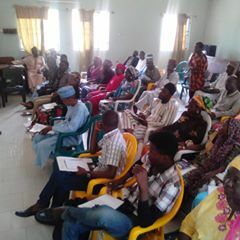 After tea break, Strategies for countering hate speech session was facilitated by Ibrahim Nuhu who started by going back to the definition of hate speech to refresh their mind the more and draw their attention to the fact that before you counter any speech you must understand hate and dangerous speech. : Countering is the general strategy to eliminate or reduce the potentials of a dangerous speech to catalyze into violence through counter speech, this may be to: neutralize the message of the dangerous speech item, Get the speaker to retract and possibly apologize and ensure people do not act on the basis of the message of the speech. Counter speech is any speech/act that seeks to neutralize or convert hate speech. Countering is different from peace campaign, they but share the same goal and purpose. Countering is the general strategy to eliminate or reduce the potentials of a dangerous speech to catalyze into violence through counter speech. 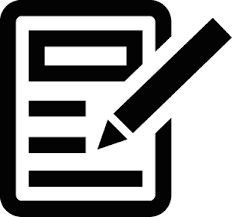 √ We want to know the procedure of technology-based reporting by using facebook? Monday Dala asked. Ibrahim Nuhu responded by showing the procedure. √ What about if people perceived your message in wrong way? Asked by Ahmad BRC. Isah Garba responded by calling audience to be straightforward and cautioned against use of ambiguous words. And in the event you did that and got misquoted you need to immediately retract and explain in the most simple and easy manner for your audience to understand. √ constitutionally there was freedom of information and expression, can CITAD protect me if someone retaliate or attack me? Ahmad Usman Abdullahi asked. You have to report him to social media he used or CITAD, if in the market report him to sarkin kasuwa, his union, traditional rulers or police. Isah Garba responded. What I have to say was thank you because most of the things I don’t know them and the little I know I don’t even put consideration on them even when I was browsing but now it come to my notice that there are some things you have to notice/considere every time one goes on internet. So thank you for this opportunity-Joy Buba student from Federal Poly Damaturo. Lastly, Isah Garba discussed with the Secondary School teachers representing the invited secondary schools on the establishment of Peace Clubs in some selected secondary schools as approved by ministry of education and that is why the teachers of those schools were here with us present. The ideology behind was to change the mindset of youth at adolescent stage to come up with peace ideas by promoting peace within themselves in schools and to their respective communities at large. He also called the name of all schools suggested and the teachers selected the patron of that Peace Club who will guide the students and lead them toward achieving desired goals. When students graduate from secondary schools and gt get admission into tertiary institutions they will join Student4Peace which is an advance level of secondary school peace club normally found at the tertiary level. The major activities are to help in peace campaign in their respective schools, communities, state and country at large by using social media, advocacy visit etc. the student 4 peace members have the opportunity to get connection with mentors who will guide him to achieve his target desire within the country and outside. The total Participants were forty seven (47) in number; forty seven percent (47%) of which were female while fifty three percent (53%) were male. PreviousPrevious post:Report on courtesy call to Chief Imam Yobe State University, DamaturoNextNext post:Report of North Central Public Sensitization on Hate and Dangerous Speech.